It might be too soon to start thinking about summer and getting a nice sun tan, however, many of us have been thinking about what swimming suit will suit us best or make us look nicer when going to a pool party with our friend or enjoying a family day at the beach. The secret for looking amazing with our swimming suits is not always going onto a strict diet or becoming a gym rat without getting any rest, although it must be said, a bit of exercise as well as a healthy diet always helps. We think that the secret lies in knowing how to choose the type of swimming suit or bikini that best suits your body type. To succeed in this task, it is very important to know that the aim is to achieve harmony and visual balance according to your anatomy. This is what the following post is about, you will find below all the information you need to know in order to make the best decision when buying your summer swimming suit. There are four main body type groups where we can group ourselves in order to find out what suits our best. The first type is the known as pear, spoon or bell-shaped body, triangle upwards. This is when the superior part of your body as well as the waist are narrower that the lower part, large hips and tiny bust. Jennifer Lopez and Beyonce are one of the many famous women who are considered to have a pear body. For this body type it is very important to accentuate the narrower parts of your body. Bikinis and swimming suits with big prints or patterns on the top half are always ideal for a triangle shaped body, leaving the hips and the rest of the lower part with a simple or more discreet pattern. Lights colours as well as flounced swimming suits are always a good choice too. Big cleavage is listed at the top of the list when choosing a swimming suit in a Pear-shaped body. Black is always a save option too. Apple-shaped women have broader shoulders and bust and narrower hips. In this second body type we can group women like Drew Barrymore, Jennifer Hudson and Catherine Zeta Jones. In this case, we will need to accentuate the lower extremity and dissimulate the shoulders and the bust to create harmony. Cup swimwear or bikini are perfect for this body type, as well as the ones with a bit of a body slimmer at the top. In this case, dark colours and smaller prints/patterns at the top and lighter or bigger prints for your hips are clearly top choices to emphasize your body shape. The third type will be the the hourglass shape. This body type is characterised by hips and bust measurements being nearly equal in size, with a narrower waist measurement. Your shoulders are slightly round and your legs are in proportion with your upper body. In such cases we accentuate the curves Kim Kardashian´s way. Tight bathing suits, bow belts and back cleavages are perfect at making your hourglass shape stand out. Last but not least, we have the rectangle body shape. In this body type the waist measurements are less than 9 inches, smaller than the hip or bust measurements. Your weight is fairly distributed throughout your body and your shape is not particularly curvy. In this case we will have to accentuate and create that curve shape the Cameron Diaz style. 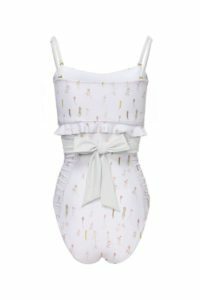 Trikinis are a perfect option for this body type, as well as prints, patterns and bows. To summarise, the 4 body types are Pear-shaped, Apple-shaped, Hourglass and rectangle body shape. By identifying what type of group your body belongs to you will now be able to find the best look for those summer parties. The swimsuit – a milestone that changed women’s history.